When Yeshua and Mother Mary walked this Earth over 2000 years ago they started a process through which humanity now has the opportunity to achieve Ascension. That family has now returned as a multitude which encompasses the Earth. What started as one cell of The family of the Christ is now a honeycomb which covers the globe. Each one of the great souls who walked together with Yeshua has returned in multiple bodies so there is not just one person who has the memories of Mary Magdalen, for example, but many. Now the light codes which they brought to Earth and seeded into the human gene pool have multiplied and are giving us the opportunity to follow in the footsteps of The Master from Crucifixion into Resurrection. 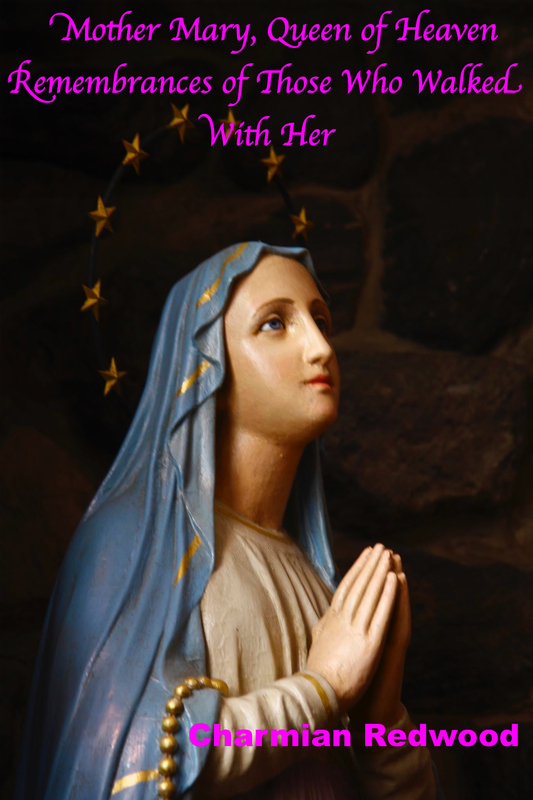 In this book many each person shares their memory of being in the presence of Mother Mary and Yeshua and the profound effect it had on their lives. The importance of the journey which Yeshua took was not the crucifixion but the Resurrection. He came to demonstrate that death is the beginning not the end, it is simply the doorway into eternal life. So we offer you our stories and invite you to share in the profound love which we all received from our Beloved Mother Mary and Master Yeshua. In writing this book I regressed 15 people to uncover the memories from their time of actually being on the Earth with Yeshua and Mother Mary. For all of us it was an extremely emotional experience. Most of us were overwhelmed by the amount of unconditional love that Yeshua and Mother Mary had for us. We were all carrying so much the old programs of unworthiness and guilt, some of it a residue from our “Christian” lifetimes where we were taught that the body is ” sinful” and that taking care of ourselves is “selfish”. Many of us were raised with the teachings that we must suffer in order to be purged of our inborn wickedness. The actual message that Mother Mary and Yeshua brought was completely the opposite, that we are completely and unconditionally loved just because we are already perfect and divine children of a loving Father and Mother God. It is with great Joy that I offer you this book with the intention that it will open your heart to receive all of the love that is here for you. I am Blessed by the presence of each one of you on the Earth at this time. The book is available now as an e Book and should be published in softcover next year. This book is not just about the words, it is the frequency of the book which is what needs to be distributed around the world because what Charmian has captured in this book is the Truth of the expression that Beloved Yeshua and I came to bring to the Earth and that is a deep, deep love and compassion in the heart for All. It was not just the words that He spoke but it was the feeling that His Presence invoked in people that really touched them in the heart. Because of the way that Charmian has guided her sessions she has been able to capture the very emotional content that any contact with Yeshua inspired in those who followed Him. This is what we wished to bring to the children of the Earth today. It is not so much a set of doctrines or dogmas; it is a very real feeling of being completely loved without judgment and this is why we chose Charmian as a vehicle for this book to be written for us because she herself is of such a heart vibration. She has been able to bring that frequency of pure love and to put it into form as we requested, this was our intention and our wish for this book. This book holds the consciousness that I give through Charmian to others. There are many of us who hold this gift of the lineage through The Marys that is going out through this book. This book will be of assistance especially to women who are coming into the gifts of their own power and their own gifts of co-creation. I will be blessing each person that reads it in the Divine Order of the Womb of The Immaculate Conception of all Consciousness. My energy is so deep in this book, the frequencies and the gifts coming through it are going to truly bring people into a state of their own Immaculate Conceptions so this is important to go back to the original purity and innocence of each person who reads the book, to open their womb of Creation and to celebrate the Divine Mother’s energy in them. We are very grateful that Charmian has offered herself in this way and has been so diligent in the writing of this book. How did I first meet Mother Mary? It was in England in 1987. I was recovering from a very painful separation with a man with whom I had a deep soul connection that was very beautiful; in this lifetime he was a seriously wounded individual. When we separated I was just heart broken and didn’t know how to get out of despair. A friend told me about the Holy Well in a chapel devoted to Mother Mary in the church of Our Lady of Walsingham in Norfolk UK. I went to the church where there is a replica of the stable where Jesus was born called the Holy House. There were coachloads of people mostly from Eastern Europe who were visiting the Holy Shrine. The floor of the stable was made of stone flags and the foreign visitors were laying facedown full length on it, prostrating themselves to Mother Mary. English people would never do such a thing as we are so conservative but as they were all doing it I just got down on the floor with them and called out to Mother Mary to help me in my despair. I didn’t know what would happen but the next minute Mother Mary was standing right over me, in her hands was a piece of Madonna blue silk. She laid the silk over my body and a feeling of such peace that I had not felt in a very long time washed over me. Just Her presence was a healing balm for my broken heart and my troubled soul. I didn’t think it would be possible to heal from this pain but gradually, over a period of a few months I would return to the sanctuary, she would take me into peace and my heart began to heal. Over the years working as a hypnotherapist specializing in past life regression from the perspective of the soul’s journey I have regressed many people who are carrying the memories of walking this Earth with our Beloved Master Yeshua and His devoted Mother Mary. She has requested me to tell her story here because so much misinformation has been written in the name of Yeshua and Herself. She wants the world to know the simplicity of their message, which is only love. The past is gone, say sorry and be forgiven, then start being love today. This is really all they had to say. I had a very powerful Near Death Experience in 1980 following the birth of my twins. The birth went horribly wrong; I ended up with septicemia and was rushed back to hospital. The first night there I experienced just floating up out of my body, there was no pain or fear at all. I didn’t know where I was going but I knew it was into peace and love. I kept floating up and up, my body was still lying in the hospital bed but I was surprised because I still had all of my consciousness but was not in my body. I floated up into a beautiful ocean of golden light; as soon as I got there I absolutely knew; this is who I am; this is where I belong; this is “home”; this is where I want to be and everything “ down there” is just a story I am playing in for this short lifetime. He just looked into my eyes with such love and compassion. There was no judgment there at all, I was the one who was looking at my life seeing the things I wished I hadn’t said or done, He didn’t care at all, He just kept looking at me with unconditional love. I had never experienced that before and it was overwhelming. Well I can tell you that at the time I didn’t have much of any of those, I always had compassion and had collected the waifs and strays in school as a child, those who were picked on by the bullies or who had bad home lives. I was 29 years old, a schoolteacher, spending my free time camping or in the pub playing darts as we do in England! I had never heard of spiritual healing or even knew much about meditation. The next minute I was floating over the body in the hospital bed knowing that if I got back into that I would be taking on suffering and if I stayed out in the golden light I would never suffer again. However my babies were only ten days old and there was no way I was leaving them without a mother so I came back into the body which I knew was just the house that “I” am living in for this lifetime. I felt tremendous compassion for this body that is doing such a great job of housing this immense soul that I experienced myself to be in the Golden Light with Yeshua. When I finally came awake it was as if everything I had done in my life up to that point was absolutely meaningless. The career as a teacher, the house, the mortgage, my life plan. There really was no “Me” anymore so I gave my life to serving the Plan on Earth and said I would go wherever I was needed. There really was nothing else to do with it, I didn’t know then what the Divine Plan was I just knew that there was one and I wanted to give my life to serve it. For the next few years I took every class I could find in meditation, healing, yoga, personal growth because I just wanted to get back to that place of being “Home” in the light. This is my memory of the time I spent with Mother Mary and The Master, Yeshua (Jesus) in their mission here on Earth. I begin with the time I first met them and which was the beginning of our life together. My friend Trevor guided me into hypnosis so that I could retrieve the memories. We are the Great Temple In Jerusalem, there is a huge crowd of people gathered in the open plaza in front of the Temple, we have come because we have heard that there is a great teacher, we call Him Rabboni. He is standing on the steps of the Synagogue and I am standing about four rows back, His mother is next to Him, He is talking and we are listening. “Beloved Brethren I wish for you to know that you are the Beloved, you are Beloved of the Father and the Mother, you are the perfect child of the Mother’s love and the Father’s love. You are whole and complete and perfect as you are, you are completely loved just as you are, and there is no condemnation from the Mother or the Father for anything that you have done or said in the past that has caused harm. TR What is Yeshua doing now? CH He raises His hand and He is blessing the people with the sign of the cross in the circle. As I receive it and everybody receives it, I feel so blessed and relieved because I was worried about things that I had done that I regretted and that were painful for those who received them. To be forgiven is more than I feel that I deserve but I receive it with gratitude and I want to know more about this man, this woman and the other woman who stands behind Jesus. It is Mary Magdalene, she stands on the left of Jesus with His Mother on the right, they stand behind Him and they radiate such a beautiful light. I want to know what that is. I have never experienced anything like this in my life before; I want to know what it is. I want to know more of Him, I want to follow Him and help Him in His ministry to spread this word. He is so young and He brings such a great message, He carries such a great responsibility that I want to help Him with that. Now He has finished His talk and the crowds are dispersing, I go up to them and I ask if I may be of service to Him in His mission. He invites me to come back to the house with them to share bread and to a meal; He invites me to accompany them. We walk through very crowded streets, the buildings are very close together, there are many alleyways and then we come to a house that has a courtyard with a fountain in the middle. There is a little garden and the house is built around the courtyard, it is cool and shady and there are trees there, the trees shade the house. We go into the house and there are two women there, they bring food to the table and we all sit down. TR How are people dressed? CH They are wearing clothes made out of rough homespun cloth, they are like long robes and the women have a cloth wrapped around their heads. Yeshua wears a simple white robe with sandals on His feet; the robe has a cord around the waist, very simple. TR Can you describe the way He looks? CH It’s His eyes, when He looks at you He looks right into your soul and He sees everything, all that you have done and all that you have been, the good and the bad, and He just accepts it all and loves it all. There is no judgment, there is no condemnation, and there is just love and acceptance. I have never felt that before from anybody and it makes me feel very humbled and incredibly grateful. I see what a remarkable Being He is, I have never heard of anybody like Him before anywhere, in any of the stories or the news that we hear, I have never heard of anybody like Him before. His eyes are a light brown, golden brown, He has long light brown hair with a short beard. He has such Presence, He can be wrathful but it’s always from love, when people need to be stopped from committing acts that hurt themselves as souls, not to punish them but to prevent them from hurting their souls. Such compassion, everything that He does is to prevent people from harming themselves by wrong action, to prevent them from having to take on karmic burdens because He understands the laws and the people don’t, so they commit acts which would cause them great hardship in the future. He sees that so He wants to save them from that, but they don’t understand so some of them turned against Him. His acts are just from pure love, not from punishment or retribution. TR What are you eating? CH Just very simple food, grapes, cheese, bread. R Is there a blessing of some sort? CH Yes there is a blessing, Yeshua raises His hand and it is almost as if a radiance washes over the food, that you almost don’t need to eat it, you just receive the radiance and it is like eating food from heaven. He connects to the Father; He connects to the energy and blesses the food with it. TR Do you have any conversation with Mother Mary or Yeshua? CH Yes, when the meal is over I go and sit with the women, they are talking and they are mending clothes. They are planning where they are going to go, they are talking about the journey and how they need to take this news out, to travel and go to many places. They are talking about how they are going to do that, they need to have places to stay along the way, they have to send word ahead to prepare the places. I am asking if I can come with them and be of assistance. I sit in front of Mother Mary and she takes hold of my hands, I feel such peace flowing from her. She has given everything, surrendered everything to serve The Master, they know that it isn’t going to be easy because there are old power structures in place that are oppressing the people and keeping them in servitude. They know that The Master has come to break the people free, to break their chains and set them free. They know that there will be resistance but she is just at peace with it all, she accepts it all. She knows the mission, she knows it will bring great trial and tribulation; she accepts that, she accepts it all and she radiates that acceptance to all. She is holding my hands and she is giving her peace to me, I feel flooded with her Presence and her acceptance (sobbing). When I look into her eyes I see eternity, I see a deep pool of infinite stillness and I see great sadness because she knows what is to come but she just accepts it all because it is the Divine plan and it simply must play itself out as it was written. Can you tell me your experience of reading the book. Mother Mary, Queen of Heaven. How did you experience the connection to Mother Mary through the book? It felt like there was a gentle Presence that was with me as I read the book. The words describe things but this feeling that was transmitted was so clear and so identified with Mother Mary that when it was described it was how I was actually feeling as I read the book. Have you felt connected with Mother Mary since reading the book? Absolutely, I now feel a presence with Mother Mary, a connection and a desire in myself to have my heart play a different role in my life than it has and to have more understanding and insight as to what it means to live from the heart. It has become a strong desire of mine and I feel that this is what the Presence of Mothr Mary and this book has done for my life. In Mother Mary’s endorsement for the book she said that she would be giving a blessing to each person who reads the book, did you experience that? Do you think that happened for you? I do think it happened and I think it is happening. Personally I now experience the Presence of Mother Mary, she made herself known to me some time after reading the book saying that she was with me and she would be with me and she was watching over me and thids is a very real presence in my life that is continuous now. Why would you recommend other people to read this book? Because this book is like no other book that I have ever come into contact with in relation to Jesus and Mary and what happened and the feelings that were invlolved and the specifics if what was taking place from a feeling and gentle and loving perspective.This book brought it to life in a beautiful way that I just want to share with everybody now personally. I think it is the book that has changed my life the most, it is the most profound relationship I have ever had with a book. How has reading the book given you a different understanding iof the mission that Jesus and Mary came to bring. Is it different from what you had previously learned from your religious upbringing. What would you say that their mission was after reading the book? To be love. Through the book I understand that more and I feel that more in my heart and I understand how to hold that more in myself and how to bring that light into myself continuously. Indeed to transmit that energy.It was a clear picture of how to become that myself. How is it different from what you had previously understood about Mother Mary and Jesus from your religious upbringing. It felt much more removed before, I describe myself as a recovering catholic now, in that these characters were presented, there was this story and there was so much suffering and fear involved and the way that I saw things displayed in church and with peopleit was, ” you have to do this and this,” and it felt very hypocritical. I didn’t feel that the spirit of the law versus the letter of the law was what I was seeing so it was really hard to connect with so if I go to church now, many churches I see pictures of this suffering and Jesus dying, it is very sad and very heavy. I remember thinking as a child; ” This is not how it is supposed to be.” In reading this book it clarifies that, indeed no that is not what was intended. The Love is was what was intended and that is what comes through as opposed to the Law. Lord Sananda Christmas Message 2014.